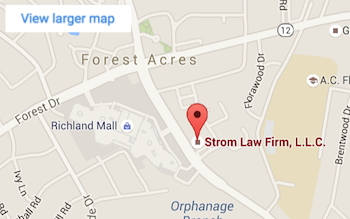 Practice Areas | Columbia, South Carolina | Strom Law Firm, L.L.C. Strom Law Firm, L.L.C. represents clients in all sorts of matters throughout South Carolina including Columbia, Florence, Orangeburg, Lexington, and Newberry to name a few, and even nationally depending on the case. Listed below are the practice areas we cover. If you don’t find what you are looking for please visit our sitemap for the full list of practice areas. If your business, ABL, or retail license has been revoked, denied, or contested, do not wait until you lose money and reputation, contact Strom Law to discuss your business and retail license problems and concerns. When faced with an alcohol or liquor license issue in South Carolina, it is important that you contact an experienced ABL attorney at Strom Law to guide you through the application process, may help ensure that your request for a South Carolina alcohol or liquor permit is approved. If you need a visa, our South Carolina Immigration Lawyer can assist you in this process. We understand the process can be complex and quite difficult. If you or a loved one has been injured or even killed in an accident through no fault of their own, and you think that you are entitled to compensation, please contact the South Carolina accident attorneys at The Strom Law Firm. A personal injury arises when one person is hurt, disabled, or even killed as a result of the conduct or negligence of another, that’s when you need to call the SC Personal Injury Lawyers to fight for the compensation you deserve. The Strom Law Firm lawyers advise and represent crime victims and their families. While we cannot change what happened, we can help you recover just compensation for your injuries or loss. To bring a qui tam action under the statute, an individual, or whistleblower, must have personal knowledge and actual evidence of fraud. Our qui tam lawyers have the experience and federal government contacts necessary to ensure that your rights and interest are protected. Whether your case involves a drug possession misdemeanor or felony drug trafficking and murder charges, contact the criminal defense attorneys at the Strom Law to discuss your arrest, possible defenses, and whether you may be eligible to have your charged reduced or even dismissed. The Strom Law DUI Attorneys offer a free consultation to discuss: your DUI arrest, whether to plead guilty or not guilty to driving under the influence, as well as possible ways to have your drunk driving charge reduced. The Strom Law drug crime defense lawyers know the evidence to look for, including whether a search warrant or arrest warrant issued in your case was properly executed and the standards by which all investigations, searches, and arrests should be performed. If you are facing divorce in South Carolina, you know family court may be unlike anything you have ever experienced before. Divorce is an emotional experience which jeopardizes your financial future and likely involves serious issues, including child custody arrangements and evaluating the worth of your family business. The best thing you can do is to call today for a consultation in Columbia S.C. We have the family court legal knowledge and experience you’re looking for. Whether you are charged with: a computer crime, mail fraud, wire fraud, or bank fraud, a RICO violation a drug crime, tax fraud, making a false statement to a federal agent, or any other Federal charge, you are likely facing a personal, family, social, business, and/or financial crisis unlike any you have ever faced before. Understanding your situation is the starting point, and basis of, the Strom Law’s Federal Defense Attorneys approach to handling Federal criminal defense cases. The tax relief attorney at the Strom Law Firm can help you settle your tax debt. We will intervene on your behalf and put your tax issues and IRS debt on hold while we review your case to determine the most effective way to resolve your tax problems. The Strom Law Firm represents individuals in administrative hearings and before licensing boards across the state of South Carolina. We will investigate the charges and strategize with you to establish an aggressive defense aimed to protect your license and ultimately your livelihood. The workplace accident attorneys at the Strom Law Firm, LLC represent injured workers, as well as their families, in the pursuit of workers’ compensation injury and death benefits. The class action lawyers at the Strom Law Firm enjoy a distinct statewide and national reputation for excellence in the area of consumer protection litigation and class action lawsuits. If you are disabled and unable to work, contact us today for a free consultation with our Social Security Disability Benefits Attorney to discuss the facts of your case and the medical documentation necessary to establish your claim of disability. To talk about your veterans’ disability benefits, your current disability rating, or what our lawyers can accomplish for you — call or contact us today for a free consultation with our veterans’ disability benefits attorney. All veterans’ disability and benefits cases are handled on a contingency fee basis. The Strom Law Firm represents individuals whose rights have been violated in the workplace as employees. Whether you are dealing with your employer’s failure to pay wages, or even a claim of discrimination, you may feel as if you do not have anywhere to turn. Call us today. The Strom Law Firm, LLC has the financial means and the access to top environmental, chemical, and hazardous waste experts to pursue toxic tort cases vigorously, and our toxic tort lawyers have established a clear track record of successful results. If you believe that you have been injured because of medical malpractice, contact a Strom Law Medical Malpractice Lawyer for a free consultation to discuss the facts of your case and possible avenues of recovery. If you believe that you or a loved one suffered a traumatic brain injury due to another person’s or business’s negligence, contact us today. People who suffer from traumatic brain injury need specialized legal representation to pursue their case. Brain injury litigation is very complex and unique. Getting fair compensation requires lawyers that are experienced, and familiar with the medical and legal issues involved.